My kit is a rare and wonderful instrument and a genuine original Art Deco antique. It was made by Francis Robert Beddard and his father at 14 Sun Street, Finsbury Square, London. I believe it is the only kit of its type in the world, and the sound is to die for! In the current music scene, one of today’s buzzwords seems to be “vintage.” Everyone wants to capture the nostalgic tones and sounds of the mid-20th century. For drummers, finding a reliable used set of drums that have stood the test of time can be a real challenge. The Grand Master kit offers a solution that is better even than the very fine original professional, orchestral instrument. 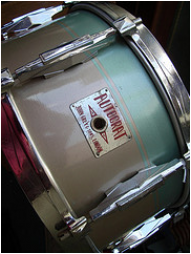 With genuine vintage thin 3 ply shells, featuring solid reinforcement hoops, vintage bearing edges and die cast hoops it provides players with a genuine vintage sound in a modern customised drum package with unique visuals. Vintage wood took longer to grow, was dried naturally not in a microwave and has cured over time resulting in a denser, superior fibre structure that cannot be replicated today. The Grandmaster is a genuinely unique and important vintage drum kit. It features what must be one of the first 20" bass drums made, handmade 1930's shells, rare and beautiful art Deco lugs and hoops plus simpatico state of the art improvements from DW and Dunnett. Deep rich tone, huge sensitivity. The overall thickness of a drum shell affects how energy is transferred from the heads. This single factor has a profound effect on both the tonal characteristics and projection of the drum. Thinner shells allow the wood to fully resonate and maximize its total contribution to the overall sound. As a shell increases in thickness, it is louder but less resonant with more of its sound projected to the audience. Thin shells have become extremely popular on high end kits again in recent years as their sound offers the best near-field or players experience. Grandmaster's 3 ply shell enables relatively easy energy transfer from the heads to the shell, thus causing the shells to fully vibrate. This vibration imparts a very rich warm wood tone to the overall sound that can be most appreciated close to the kit while it's played. This effect is great for recording where miking techniques can capitalise on the warmth and natural tone of the instrument. Most manufacturers offer a thin shell on their high end drum series and Grandmaster is a perfect presentation of what they are trying to achieve. The shell also features a solid 1 ply reinforcement ring at both top and bottom to help strengthen the shell and add support at critical head contact points for stability. Birch drums have gained an almost cult following over the years for their "naturally EQ'ed sound". A slightly boosted hi-end cut, a smooth, mellow mid range and a deep low end presence. Many popular Birch shell drums have found their way into top recording studios, where they are a favourite of both the player and the engineer. Slight alterations in the shell's construction greatly influence sound. Some woods possess a vertical grain pattern that when tested, dramatically lowered the pitch of the shell. Thus, Vertical Low Timbre was discovered, for those players who prefer a lower overall tone while still maintaining maximum resonance and attack. The grain pattern of the plies in the shell has the outermost and innermost plies running vertically, and not the traditional horizontal. This vertical grain places lower tension on the shell, allowing it to vibrate more freely, and the sound travels up to four times faster along the grain than it does across it, resulting in the lowered fundamental pitch. Shallower depths result in more responsive toms that 'speak' faster. When these shells were made, two top toms would have been mounted either side of a large bass drum on a traditional console kit. By using the larger one as a fusion-style, suspended floor tom, the original, antiquated configuration suddenly becomes ultra-modern. The Coated Powerstroke 4 is a 2-ply head that features a thin underlay at the outer edge of the head to subtly dampen high frequency overtones. This creates a near-perfect balance of response and tone control. Powerstroke 4 offers more durability and focused mid range tones making them the darkest sounding of the classic coated Remo heads. Clear Pinstripe heads are made with two 7-mil Mylar plies, and have quick decay, making them ideal heads for the “fat” sounds of Pop, Rock and R&B and for those who want a low pitched sound with moderate attack and response characteristics. A measured layer of a ring reducing agent is applied between the two plies at the outer edge of their trademark stripe to dampen high frequency overtones for warmer resonance. Smooth White Drum heads have unique sound properties middling coated and clear heads with warm mid range tones, resonance, and sustain. Smooth White heads are great for additional mid range sounds of tom-toms and bass drums. The Smooth White Ambassador heads are medium-weight heads made with a single-ply 10-mil Mylar film to produce open, warm resonant sounds with a warm attack. Smooth White Ambassador drum heads are great for all playing situations and are an industry standard for marching bass drum applications.